Born in Huntsville, Texas in 1939, the elder Harrelson spent little of his adult life as a traditionally productive member of American society. He was convicted of armed robbery and other crimes in addition to another murder for hire in Texas. At one time, he was suspected of being one of the three ‘bums’ arrested behind Dealey Plaza in Dallas just after the Kennedy assassination. He even confessed to involvement in Kennedy’s murder at one point, but in the end, the three ‘bums’ were all identified and he wasn’t one of them. Woody Harrelson worked to have Charles’ conviction for the murder of Judge Wood overturned and apparently financed the legal work that never accomplished its goal. Notwithstanding the fact that his prison sentence for killing Judge Wood was served in federal prison, Charles Harrelson has become one of the Texas Prison System’s iconic characters. Some memorabilia reportedly taken from his cell while in the Walls and Eastham Units of the Texas Prison System are even on display at the Texas Prison Museum in Huntsville. His infamy in Texas prison history is likely to be primarily because of his son’s fame as an actor rather than his own rather miserable criminal career. During his life, Charles Harrelson was described as many things, including a prison snitch, cowardly killer and opportunist. It is difficult to find any positive comments about the man’s life, but for those of us who have enjoyed Woody Harrelson’s television and movie roles, Charles Harrelson did one good thing sometime in October of 1960. Charles Harrelson died in federal prison on March 15, 2007. If you enjoyed this little piece of history, let me know by commenting on my blog or by visiting my website at http://www.LarryWatts.net to view more of my writing. Anthony Comstock – J. Edgar Hoover’s model Sergeant No. 97 – Was she the first female officer? Harrelson was everything and more you wrote. I remember him vividly during the 70's and was disappointed he did not receive the death sentence. If I were his progeny, I could not feel any pride or comfort knowing my father was to say the least, a hired killer and a coward. I guess that is the reason I cannot and have not seen but one movie he made and he then reminded me of his father. I saw too much likeness in not only appearance, but in his manner and actions. 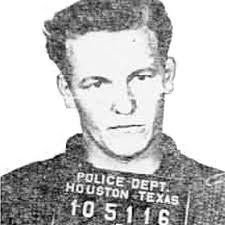 I am having a difficult time finding the record of Charles Harrelson relative to his conviction in 1960 for armed robbery. Does anyone know when he was either released or paroled following his conviction? I haven't found much. Several articles indicate it may have been his first "real" crime and there is some indication it may have occurred in California. But that is based on speculation. I knew Charles on the Eastham Unit Unit in Texas. I would like to personally tell Woody about that because his Dad and others did me a very good turn. Very few men are all bad and Charles was certainly not one of them. Contact me by writing: Hugh Callaway, 902 Oak St.Apt 1, Houston, Tx. 77018. Next month I am shutting down my smart phone to save money(that is why contact by U.S. Mail is necessary).